Latest Update : As per data available to us at (5.00 p.m. ) 5th January 2012, Phobos Grunt completes one rotation around the earth every 87.30 minutes. It Positioned at 6.2N,120.5W (Check the Map) Re-entry is expected in 5 hours. What is Phobos Grunt Mission ? Phobos-Grunt was an attempted Russian sample return mission to Phobos (one of the moons of Mars). 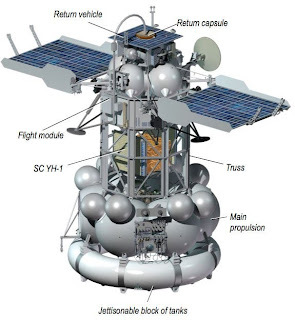 Phobos-Grunt also carried the Chinese Mars orbiter Yinghuo-1 and the tiny Living Interplanetary Flight Experiment funded by the Planetary Society..
COSPAR ID: 2011-065A is the identification number of this mission. What will happen on 15 or 16th January 2012 ? This probe will first re-enter earth atmosphere and over 200 kgs of its parts are expected to survive and fall on earth. But no one know wether it will fall in ocean or on land and where. When was this mission launched ? And what happened ? It was launched on 8 November 2011, 20:16 UTC from the Baikonur Cosmodrome, but subsequent rocket burns intended to set the craft on a course for Mars failed. Which left it stranded in low Earth orbit. What is the weight of this probe ? Which vehicle was used to Launch ? What was the actual duration of the mission. What kind of Mission was this ? Were there any efforts to recover this craft ? Attempts continued for several weeks to try to communicate with the spacecraft in the hope that it could be repurposed, or at least diagnostic telemetry could be obtained, with the European Space Agency aiding the Russian Federal Space Agency in tracking the craft. However, efforts to recover the craft were unsuccessful, and it is now on course to fall back to Earth in an uncontrolled manner, probably on January 15, 2012. The Russian news agency RIA Novosti reported on 24 November 2011 that the mission had been pronounced a failure because the spacecraft could no longer be sent to Mars, the final opportunity to do so having passed on 21 November. Who is creater of Phobos Grunt ? 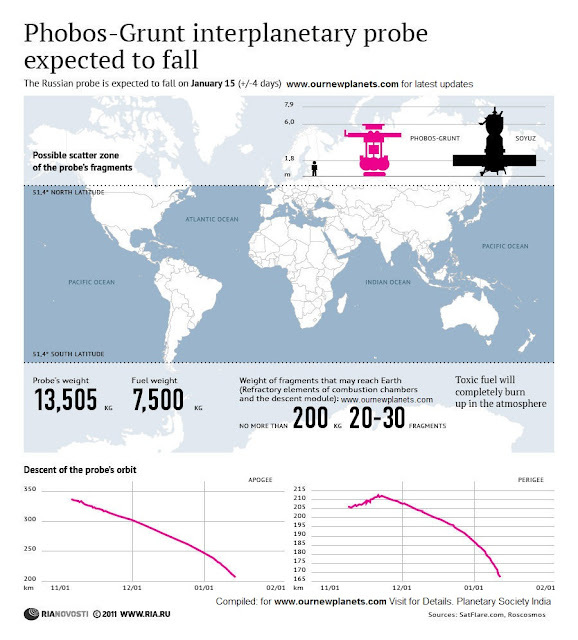 What was expected result of Phobos Grunt mission ? The return vehicle, carrying up to 200 g of soil from Phobos, was to have returned to Earth in August 2014. Phobos-Grunt was designed to become the first spacecraft to return a macroscopic sample from an extraterrestrial body since Luna 24 in 1976.
Who is Monitoring the Re-Entry of this Mission ? Plantary Society does not know who among these three sites is accurate. Q. What was the purpose of Phobos Grunt? Phobos Grunt was sent to study the atmosphere and dust storms, plasma and radiation of Mars from orbit. Its mission also included landing on Phobos and returning a soil sample from Phobos to Earth using a sample return vehicle. Q. What were the science goals set for Phobos Grunt? Q. What was the total budget of Phobos Grunt? The cost of the spacecraft was 1.5 billion rubles or $64.4 million. Project funding for the timeframe 2009–2012, including post-launch operations is about 2.4 billion rubles.Total cost of the mission is 5 billion rubles or $163 million. Q. Who were the partners? The Chinese Mars probe Yinghuo-1 was sent together with Fobos-Grunt. Q. Where will it fall? 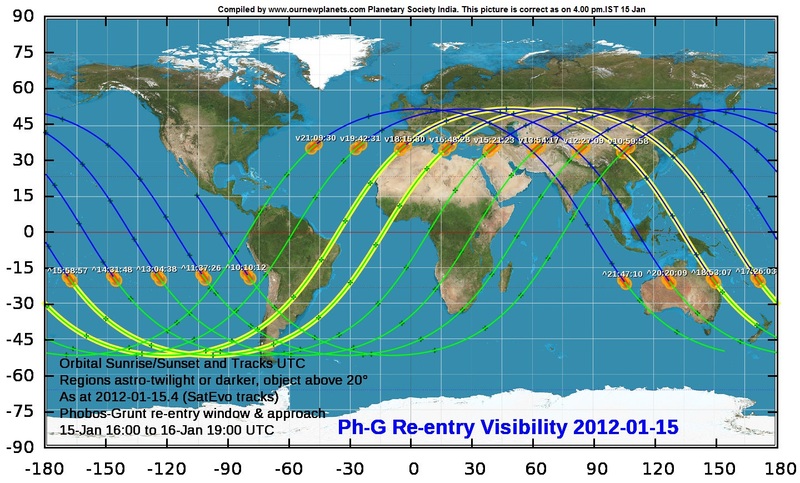 The reentry zone has not been predicted yet. Q. What risk does it pose?